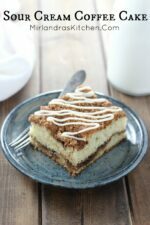 This moist and tender Sour Cream Coffee Cake is one of my favorites! It is the perfect blend of vanilla scented cake and layers of cinnamon brown sugar. I’ve been making this coffee cake for almost 15 years now and it is still my favorite recipe. I love the simplicity and the quiet elegance of a good coffee cake. There is nothing fancy or pretentious about it – just a good treat with plenty of vanilla and cinnamon. In college I lived in a co-op house for a few years and all the girls had weekly chores. As you can imagine the kitchen chores were always my first choice. My roommate Carol and I liked to get breakfast prep together and we would make this coffee cake on Friday mornings. 55 women have trouble agreeing on much but the coffee cake was a unanimous hit! I have lots of lovely nostalgic memories of that season of my life but this coffee cake is one of the best ones. (It sure beats out the initiation where I got made into a human pancake and got butter in my ears…) College – nothing else quite like it! Fall is just around the corner so tuck this recipe into your pantry and plan to make it a few times on a cool crisp morning or for a holiday breakfast! Love breakfast? 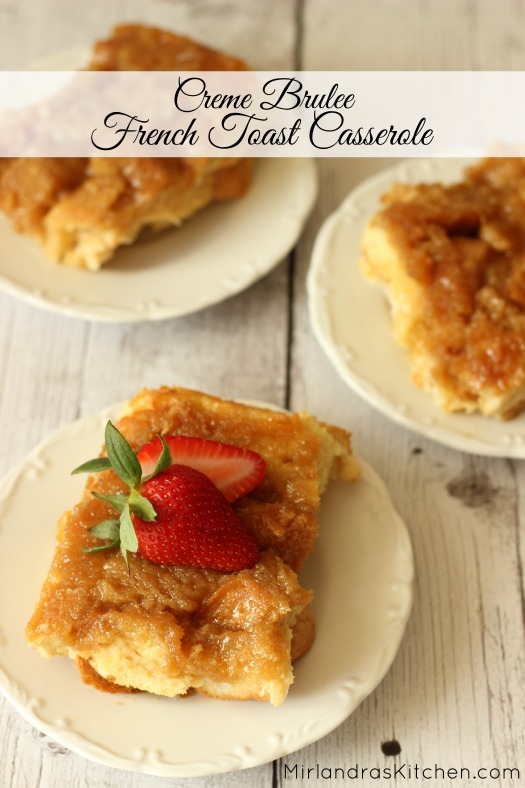 This Creme Brulee French Toast Casserole is another of our favorites! Heat oven to 350 F. Butter a 9”x12” baking dish and set aside. In a small bowl use a fork to combine the brown sugar, cinnamon and pumpkin pie spice. In the bowl of a stand mixer fitted with a paddle attachment, cream the white sugar and butter together on high until light and fluffy. Beat in the eggs and vanilla on medium until well mixed, scraping the sides as needed. In a medium bowl whisk together the flour, baking powder, baking soda and salt. Measure the sour cream. Add about ½ of the flour mixture to the mixer and beat on low while adding about half of the sour cream. As the batter starts to look mixed add the rest of the flour mixture and sour cream. Continue to beat on low to medium until the batter comes together. 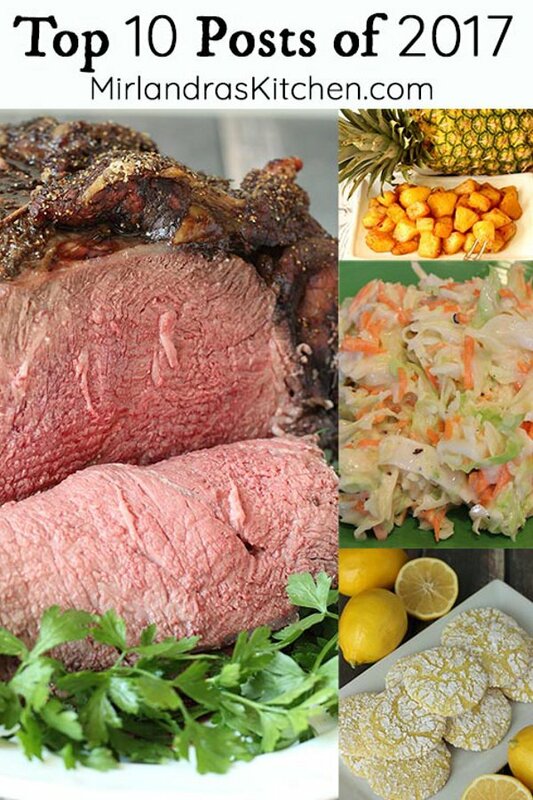 Scrap the sides with a spatula as needed. Spread a little bit more than half the batter into the pan. Sprinkle half of the cinnamon mixture of that. Top with the rest of the batter and then the rest of the cinnamon mixture. Bake at 350F for 35-40 minutes, until a cake tester or toothpick comes out with damp but not wet crumbs. The cake can be glazed hot or cold. If you want to glaze the cake hot, spread the glaze over or drizzle it on. The glaze will melt into the cake some. If you glaze the cake when it is cool you can drizzle glaze on in a pattern and it will set up that way. Microwave the cream cheese and butter until very soft but not quite melted – about 30 seconds. Whisk in the powdered sugar. Then whisk in the milk and vanilla. 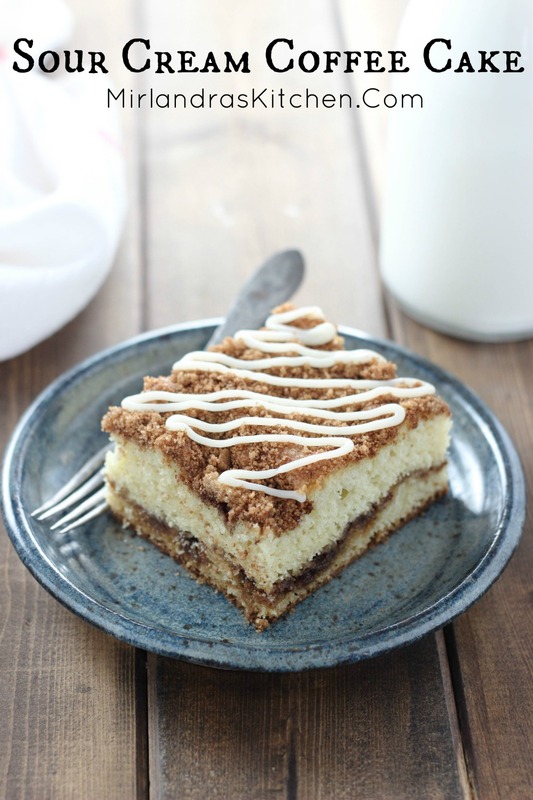 This Sour Cream Coffee Cake was adapted from the Betty Crocker Cookbook. 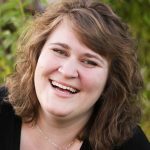 Yay Mirlandra! Congrats on ur cookbook coming out soon!